When last we left Godzilla, he was tiny size and loose in New York City, having just defeated a rat in ultimate combat. But to reuse an obvious joke, Godzilla was drinking milk, and soon grew up to child size. Just the size that Godzilla and Robert and run around together like they’re pals. Thus the central premise of Godzilla #19. 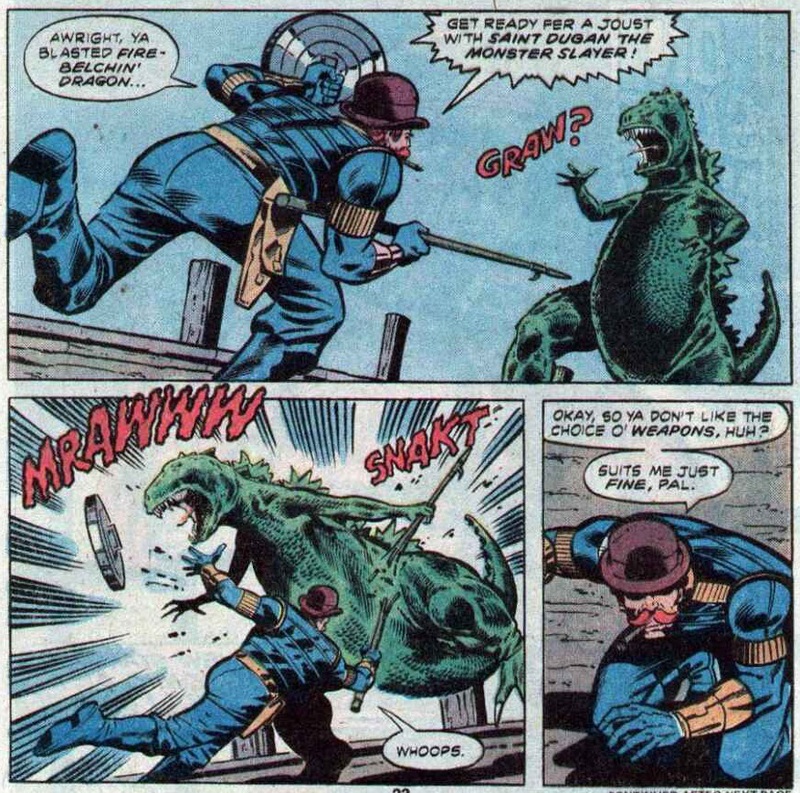 If you are completely lost with Marvel’s Godzilla, we have a Godzilla Marvel Splash Page. Robert now has to lead the child-sized Godzilla through the city without being seen, to get to a safe zone before Godzilla grows any bigger. Needless to say, this is easier said than done. The cops spot them and give a short chase. 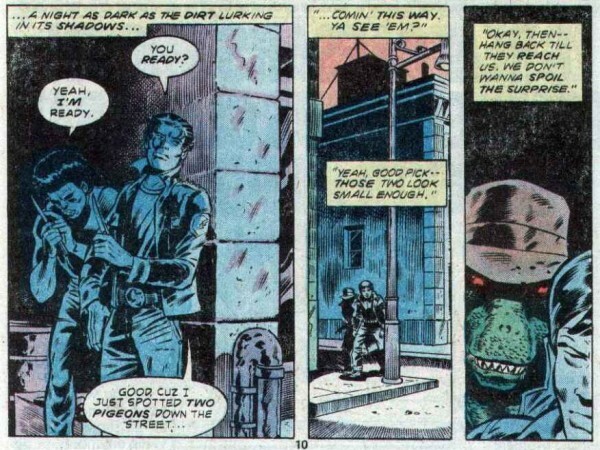 Robert realizes he has to disguise Godzilla, because New York City cops in the Marvel Universe are going to stop anyone who looks non-human. This is 1970s New York City, so the pair are quickly mugged! 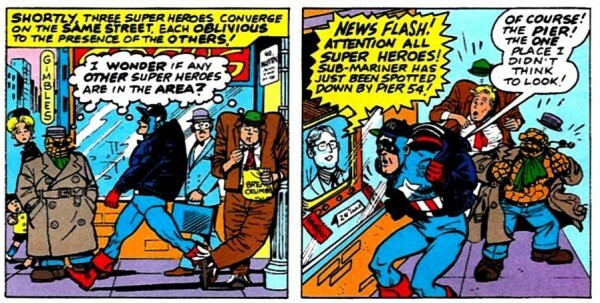 You would think that muggers would known not to mug obvious superhumans in disguise, but apparently not. A quick shot of fire breath solves that problem. 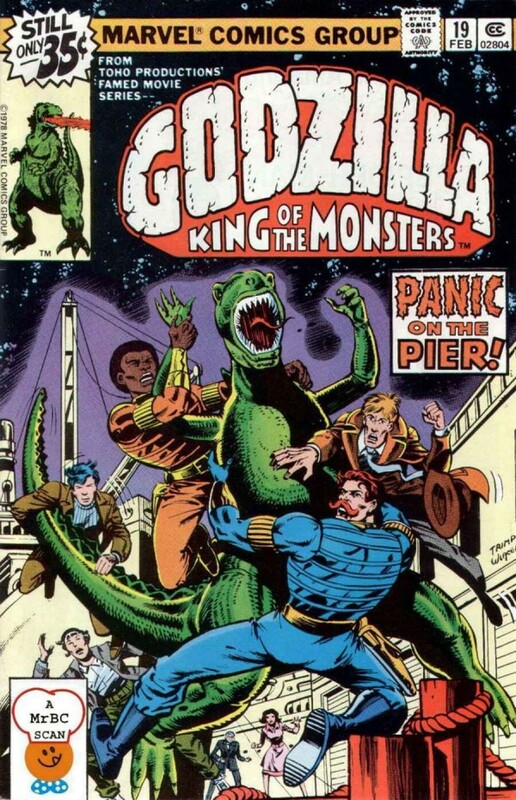 The Godzilla Squad is dejected, having found neither hide nor hair of Big G, and yet Rob and Godzilla walk right up to them. 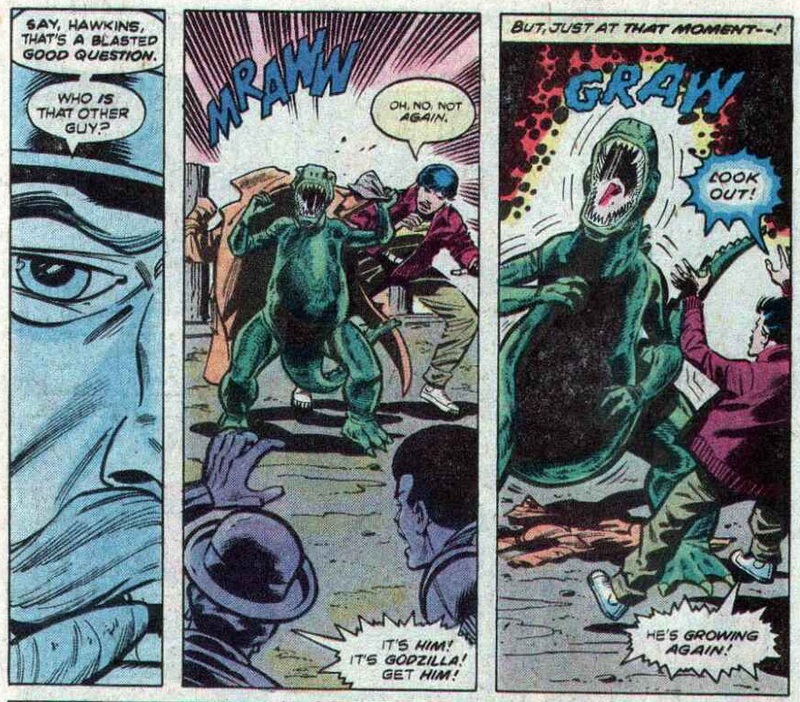 Godzilla whips off his disguise, this is the second time he does this (first was against the muggers) and it seems someone really liked that idea. 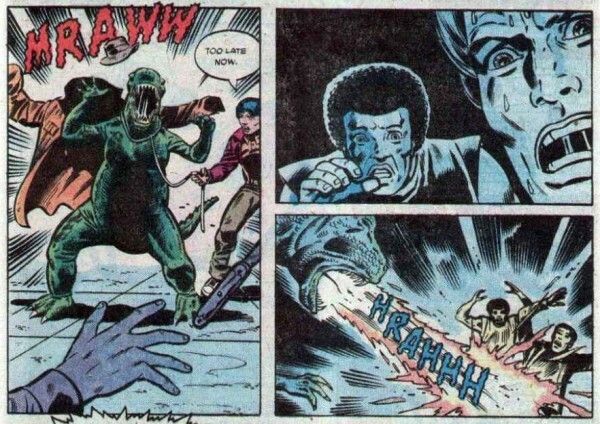 Godzilla then grows to seven feet high as Dum Dum and Gabe attempt to capture him. At one point Godzilla hits Dum Dum and the sound effect is “SPAM”! In the Marvel Universe, why is anyone in New York City trying to mug someone in a trench coat and hat? Godzilla just loves whipping his clothes off! 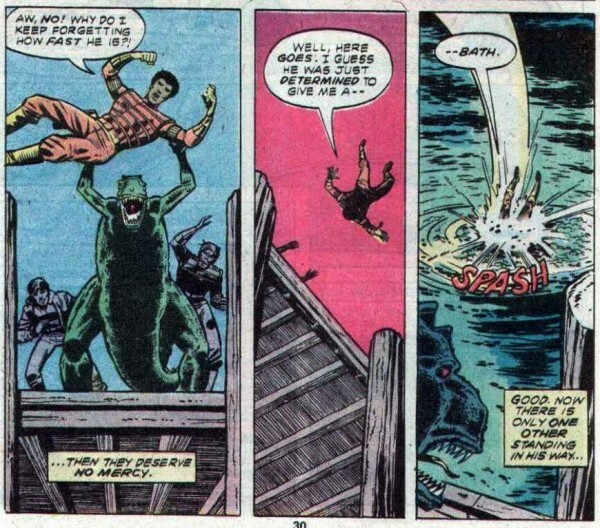 Godzilla defends his title belt by tossing everyone out of the ring!